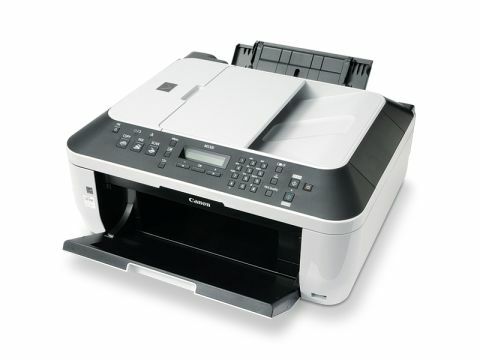 The Canon PIXMA MX320 is a four-function device that can print, fax, copy and scan. Connectivity is via USB or optional Bluetooth. Like all recent Canon printers, the output tray opens automatically when you start printing, a delightful touch that spares you the chore of having to open it yourself. Printing our standard test image onto ordinary photocopier paper using Preview's Standard quality setting gives mixed results. It's serviceable, but there is far too much banding in the darker areas. Ramping the print quality up to High improves things, but it still lacks the vibrancy of Canon's five-tank machines. Text printing is reasonable and its speed acceptable - a 20-page text file prints in three minutes, 28 seconds. Where the MX320 really falls down is in its user-friendliness. The onboard controls are awkward, forcing you to reach for the manual to carry out tasks that should be intuitive. The two-line, monochrome LCD panel is cheap, even for a sub-£100 printer, and the bundled software is risible. But then, how many of us use software bundled with our MFDs anyway? The MX320 isn't bad, but it's a disappointment compared to other printers in the Canon range. The MP630 is a much better all-round performer, and it will only set you back an extra £30, so unless you desperately need fax functionality, go for that model instead.